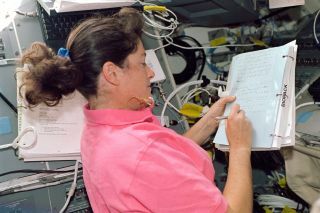 Astronaut Laurel B. Clark, STS-107 mission specialist, conducts checks of the Yeast Cell Stress Under Microgravity (YSTRES) experiment in the Biopack glovebox on the middeck of the Space Shuttle Columbia. CAPE CANAVERAL, Fla. — As shuttle Columbia's 16-day research mission passes the half-way mark, the vast majority of the planned work aboard the orbiting laboratory is getting done despite a persistent problem dealing with slightly warmer temperatures in the Spacehab module. Mission managers continue to treat the trouble — a glitch related to the cooling system inside Spacehab — as an annoyance. The temperature in Spacehab was running about five degrees Fahrenheit above normal, and although the astronauts and animals inside Spacehab seemed not to notice the warmth, some sensitive experiment samples and supplies were moved to a cooler part of the shuttle. "At the end of eight days in orbit on STS-107, many of NASA's science payloads aboard shuttle Columbia were active, others were drawing to a conclusion and still others were waiting to replace them," John Charles, a NASA project scientist, said Friday. Among those experiments wrapping up, Charles said, was the study of blooming rose and rice flowers grown in space in an effort to create new fragrances on the ground. Essential oils — which are the basis of a perfume's scent — were extracted from the flowers six times during the past week. An ongoing study of combustion processes in space, meanwhile, made its first run Friday using methane fuel instead of hydrogen. A tiny blue flame could be seen by the astronauts as they studied fire balls created with very lean mixtures of fuel and air. One run of the combustion experiment scheduled for Friday evening was going to attempt to burn for a record 10,000 seconds, Charles said, noting that space shuttle Columbia would be allowed to drift freely during the run to assist in the effort. Another research effort earning attention on Friday was a trio of science experiments examining the reasons why astronauts lose bone mass in space at a rate 10 times faster than seen in patients suffering from muscular dystrophy and osteoporosis. Known as OSTEO-2, the Osteoporosis Experiment in Orbit is a Canadian Space Agency (CSA) project that first flew in 1998. "By understanding what's happening in space at this rapid rate of bone loss, this could help us understand what's happening here on Earth," said CSA program scientist Nicole Buckley. Of the three experiments, two seek to combat bone loss by treating bone cells with hormones while third is testing to see if there is a link between sleep depravation and bone loss. "Basically all of these experiments are taking a different approach to looking at the cellular and molecular events that occur with bone formation and also with bone loss in space," Buckley said. Launched Jan. 16 from the Kennedy Space Center, the STS-107 mission is scheduled to return to Florida on Feb. 1, landing at 9:15 a.m. EST (1415 GMT).